Kuta beach is a popular tourist spot in Bali located in south of Denpasar city, just 15 minute drive from Ngurah Rai Airport and one of main attraction in Bali island, which is carry the name of Indonesia especially Bali island famous in the world. 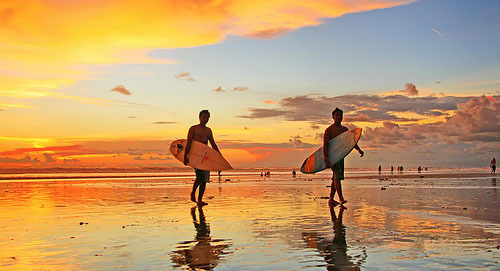 Kuta beach famous for its white sandy beach and a place to perform a wide range of beach activities such as : surfing, canoeing, and sunbathing. A lot of accomodation in Kuta from low budget until high budget such as: lodging ( small house and cheap price, the price from daily price, weekly and monthly price). Or you are looking for luxury accommodation is available here like 3 start hotel, 4 start hotel or 5 start hotel. Along the way Kuta Beach you can see a wide range restaurant all offering superior menu and high qualities from local, national and international cuisine. If you are on holiday in Bali and want to enjoy your holiday with the nightlife, in Legian-Kuta is the place. Along the way Legian especially near the Legian Monument is an area nighlife. Such as Bounty discotheque, Engine room Discotheque and many other. There is 4 malls ready pampering your holiday, one of them is Beach Walk Mall which is located on Kuta Beach Street, and other is Matahari Mall located on Jl. Raya Kuta nearby Kuta Art market, Descovery Mall located on Jl. Kartika Plaza nearby Waterbom Park Bali, Lippo mall located on Kartika Plaza street 2 km south of Discovery Mall, all of them provide your needed during holidays. And do not forget to visit Kuta Art Market, Kuta Art Market is one of tourist attraction places of Bali that you must know. Kuta Art market selling Bali handicraft and many others all about Bali. You can bargain to get satisfactory price. And other supporting facilities like SPA, Café , Recreation Park.